Daniel “Rudy” Ruettiger (Sean Astin) has one dream: to play football for Notre Dame. Rudy has been told by everyone that he is too small to play football. Sure, he does ok playing in high school. But, aside from his lack of size and not being great, his grades aren’t good enough to get him into Notre Dame. Also, his family isn’t really in the financial position to send him there, even if he did get in. Rudy puts his dream aside to work in the local steel mill with his friend Pete (Christopher Reed). When Pete is killed in an accident at the mill, Rudy realizes that life is too short to settle for anything less than his dream. He decides he will do whatever it takes to make his dream come true. Rudy heads to Notre Dame and in looking for anyone to talk to about getting into the school, he talks to Father Cavanaugh (Robert Prosky). 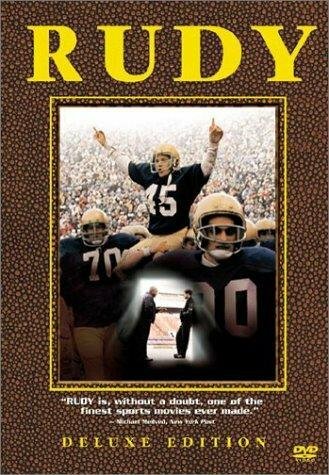 While the priest tells Rudy that he’ll most likely never make it into Notre Dame, let alone onto the football team, he gets Rudy into a nearby junior college. If Rudy can get good enough grades, he will be allowed to transfer to Notre Dame. Rudy is determined to do whatever it takes to make it into the school and onto the football team. He spends time at Notre Dame, volunteering for anything that gets him close to the team. This includes volunteering to work for free as a groundskeeper at the stadium. Fortune (Charles Dutton) agrees to let him work as a groundskeeper. Rudy also takes it upon himself to talk to Coach Parseghian (Jason Miller) about joining the team once he gets into Notre Dame. While hanging out at Notre Dame, Rudy meets D-Bob (Jon Favreau), a grad student at Notre Dame and teaching assistant at Rudy’s school. D-Bob agrees to help Rudy with his studies in exchange for Rudy helping him meet girls. The two become friends. Once Rudy finally makes it into Notre Dame, he signs up as a wlk-on for the football team. Walk-ons rarely, if ever, get to suit up for a game. That fact doesn’t discourage Rudy. He works harder than everyone on the team (much to their dismay), all in the hopes of putting on a uniform for at least one game. Rudy is another of the films I have been harassed about for years about the fact that I haven’t seen it. After watching it, the harassment was deserved. What makes this an even more amazing film is that it is based on a true story. I can’t imagine the guts it would take to essentially demand from everyone at the school, and one of the biggest coaches in college football history, that they let you live your dream. I don’t know that anyone other than Sean Astin could have played Rudy. Not only does he fit the physical stature, he makes the character come alive. He makes you care about Rudy. Makes you root for him. It was funny to see Jon Favreau and Vince Vaughn so young. Yet, even in their youth, they are able to hold their own with such seasoned vets as Charles Dutton and Ned Beatty. The entire cast does a great job supporting Sean Astin. I’ve always heard that Rudy is the one movie that can even make men cry. Now I get it. It really is a moving film. If you haven’t seen it yet, you definitely need to add it to your list. This is one I’m glad I was able to cross off my list.